I have a confession to make: I may be addicted to Skillshare. I would take all of the classes and learn all of the things, if only I had the time. Have you heard of it? I recently enrolled in what looks to be an interesting class on "How to Write a Killer Magazine Article Pitch," which starts tomorrow. 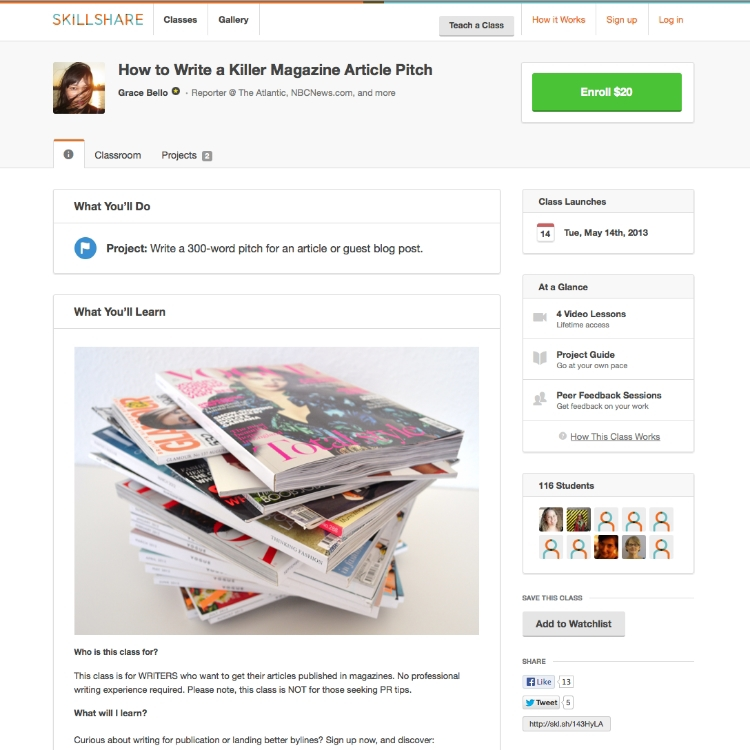 If you're at all interested learning how to write pitches, you should join me! The class is taught by reporter, Grace Bello who has worked for media outlets such as The Atlantic, Publishers Weekly and NBCNews.com. While I have pitched several story ideas and had a few pitches lead to published articles, I am beyond ready to sharpen my skills. Many classes are set up so you can go at your own pace. You can get some great feedback on your work from industry professionals. The classes are reasonably priced. Learning from fellow classmates is a huge bonus. Speaking of bonuses: if you are new to Skillshare and sign up using this link, you can get $10 off on your first class! Not bad, right?